More than four years ago, Steve Jobs declared war on Flash and heralded HTML5 as the way to go. You could be forgiven if you thought the HTML5 standard — the follow-up to 1997’s HTML 4 — has long been set in stone, given that developers, browser vendors and the press have been talking about it for years now. In reality, however, HTML5 was still in flux — until today. The W3C today published its Recommendation of HTML5 — the final version of the standard after years of adding features and making changes to it. As a user, you won’t notice any changes. Chances are your browser already supports most HTML5 features like the <video> element and vector graphics (unless your employer forces you to use a really old version of Internet Explorer, that is). Other important new features that HTML5 has brought to the web over the last few years are things like the <canvas> element for rendering 2D shapes and bitmap images, support for MathML for displaying mathematical notations in the browser, and APIs for everything from offline caching to drag-and-drop support. Any non-interoperable features the group discussed were moved to HTML 5.1 (including the controversial idea of adding support for some kinds of digital rights management right into the standard). HTML 5.1 may be released as early as next year, and the Working Group will continue to work on those features that were excluded from HTML5. At some point in the standardization process, it looked like it would take as long as 2020 to get to a final recommendation. Thanks to the W3C’s “Plan 2014,” we have a final version today. As Cotton told me, though, he also believes that this was the biggest compromise the different stakeholders agreed to. Cotton notes that the challenge for organizations like the W3C and HTML Working Group will be to keep up with the evolving environment of doing open standards and to respond to these changes. “For example, the tools that developers use to do their day jobs today i.e. GitHub, social media, etc. are much different than five years ago, and if we want future work of the HTML Working Group to engage web developers then we need to evolve as that environment changes,” Cotton says. 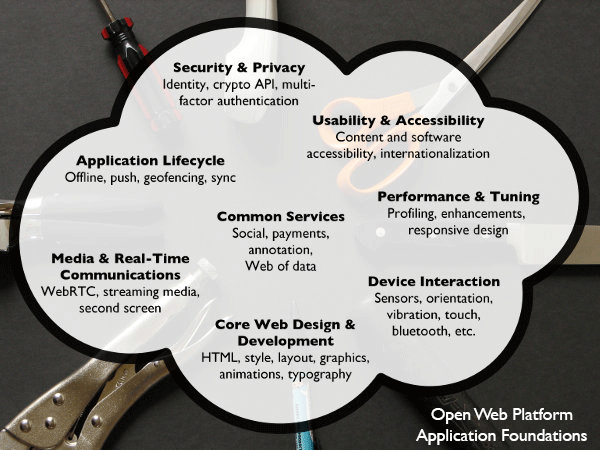 Similarly, the W3C today notes in its press release that the next version of the standard needs to focus on a number of core “application foundations” like tools for security and privacy, device interactions, application lifecycle, media and real-time communications and services around the social web, payments and annotations. All of these are meant to make it easier for developers to support the web platform. With the final recommendation for HTML5 done, the W3C will now immediately start fixing bugs, but most importantly, it’ll work on HTML 5.1.